You don’t have to meander through the history of Northumberland for very long before you stumble over the terms bastle, pele tower and fortified house. The raiding Scots and the fraught inter-family feuding saw to it that anyone who had anything worth stealing would do their best to keep out the wandering baddies with the construction of these stone-built strongholds. 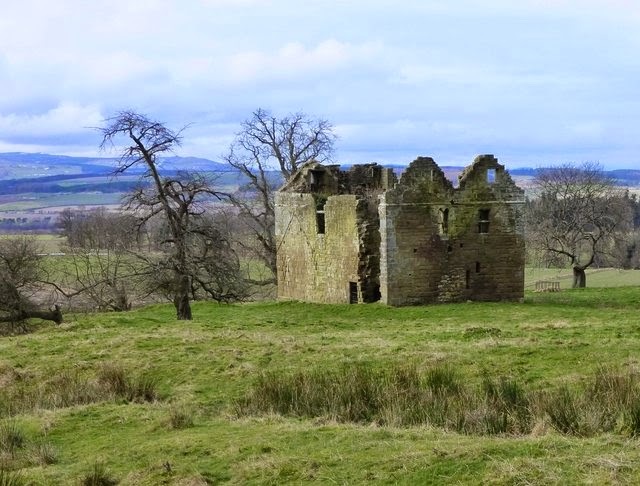 Hepburn Bastle, though, is a curious affair. Situated at the southern end of Chillingham Park, it has defied accurate categorisation since its (probable) late 14th century creation. Described now as a ‘bastle’, it is more accurately a ‘fortified medieval tower house’. Though ‘tower’ is stretching it a bit, fortified it most certainly is. To complicate matters, buildings were added to it in the 16th and early 17th centuries – extensions which have since disappeared. Though it may have been built in the 1300s, it first appears in the records in 1509 as, simply, a ‘hold’, then pops up as a ‘tower’ in 1542, and by 1564 it is described as a ‘mansion house’. Its dimensions are impressive. It measures 16.6m by 10.8m, is still three levels high despite being a ruin for an awfully long time and sports walls which are 2.7m thick at basement level. The ground floor comprises a barrel-vaulted basement with a later fireplace in the north wall – almost as if it was originally used (as in a bastle) to protect livestock, then later converted for human use – and at the east end a doorway leads to a mural chamber. The first floor has/had three rooms, each with a fireplace. The attic level, now minus its roof, has traces of fireplaces, windows and a window seat. Both the upper floors had their windows added after the Border region had quietened down somewhat – and were connected by a spiral staircase. Though it is now known as Hepburn Bastle the original name was almost certainly Hebburn or Heburn – as is evidenced by its description in a 1715 survey as “a handsome house bellonging to Robert Heburn, esq.” (the ‘p’ was, we think, somewhat mysteriously introduced by the Ordnance Survey). The structure appears to have fallen from use around 250 years ago after the last Hebburn male heir died.